A natural outgrowth and expansion for the continuation of the highly successful Dr. Betty Shabaaz Delta Academy: Catching the Dreams of Tomorrow, Delta Academy was created to catch the dreams of African American at-risk, adolescent girls aged 11-14. 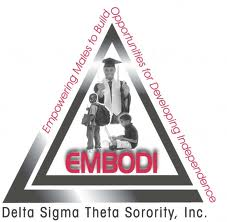 The EMBODI program is designed to refocus the efforts of Delta Sigma Theta Sorority, Inc., with the support and action of other major organizations, on the plight of African American males ages 11-18 years of age. Both informational and empirical data suggest that the vast majority of African American males continue to be in crisis and are not reaching their fullest potential educationally, socially and emotionally. EMBODI is designed to address these issues through dialogue, and recommendations for change and action. As a character development program for young men, EMBODI participants will participate in community service activities, provide opportunities for interaction with community professionals and positive male role models, and provide access to and application of diverse learning opportunities through cultural and community support. Application must be filled out COMPLETELY and should be completed online. All applications must be received by 11:59 pm on October 26, 2018. Personal information provided on this form is confidential and will be handled in a manner consistent with applicable Privacy Laws. By completing this application, I understand that my child and I are applying to participate in a youth program of Delta Sigma Theta Sorority, Inc. held by the Savannah Alumnae Chapter. Are you related to a member of Savannah Alumnae Chapter? In order to be considered for each program, each youth participant must provide a letter of recommendation completed by a teacher, counselor, or community leader (i.e. pastor, public official, business owner, non-profit organization manager). Please copy this link and share it with the person you would like to recommend you. NOTE: The application is not submitted until you select the "submit" button at the very bottom of the page.